I think I may have talked about being a part time vegetarian on here before or maybe I haven't. Anyway it's been a thing in our household for some time now. While I wouldn't want to give up meat completely, I have absolutely no problem with not eating it most days of the week. It's just healthier and actually more economical and better for the environment as well. 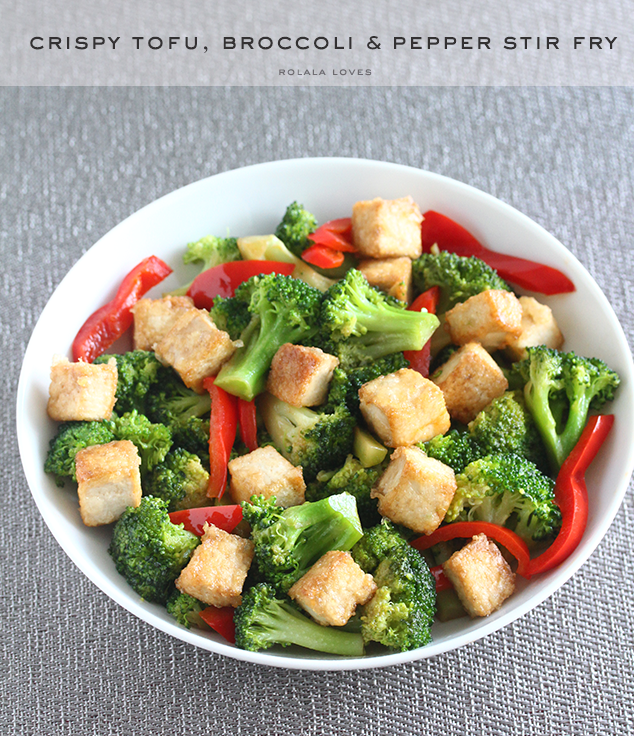 One dish that I make pretty regularly is this crispy tofu, broccoli and red pepper stir fry which is a meatless adaptation of a favorite dish that I originally made with flank steak in place of the tofu. I cook with broccoli and red bell peppers alot because they're loaded with vitamins and antioxidants and we happen to like the way they taste. Making the tofu crispy adds a different dimension in texture which works quite well with the vegetables and it's really tasty too. I usually serve this with rice, well because my husband really likes his rice. Arrange the tofu in a single layer on a paper towel lined baking sheet and cover with paper towels. Place a tray on top and put some cans over it, distributing the weight evenly. Let the tofu drain for about a half an hour. Dry the tofu and marinade it with a mixture of 1 tablespoon soy sauce, 1 tablespoon sesame oil, 1 tablespoon rice vinegar, 1 tablespoon water for 20 minutes. Transfer the tofu into a shallow dish and toss gently with corn starch to lightly coat each cube. Heat your oil in a large nonstick skillet over medium heat. Add tofu and cook, turning frequently to get all sides crispy. Set aside on paper towels to drain. Heat the skillet again and cook the bell peppers. Set aside. Make a sauce combining 3 tablespoons soy sauce with 1 tablespoon cooking wine, 1 tablespoon rice vinegar, 1 tablespoon sesame oil, 1 tablespoon cornstarch and 1/4 cup water. Add oil to your skillet and heat it up again. Lightly toast the garlic in there before adding in the broccoli. Stir continuously for 30 seconds and let it cook uncovered. Then pour the sauce over, mix and cover. Cook for 3 minutes until the broccoli is tender. Add the pepper back in and toss together. 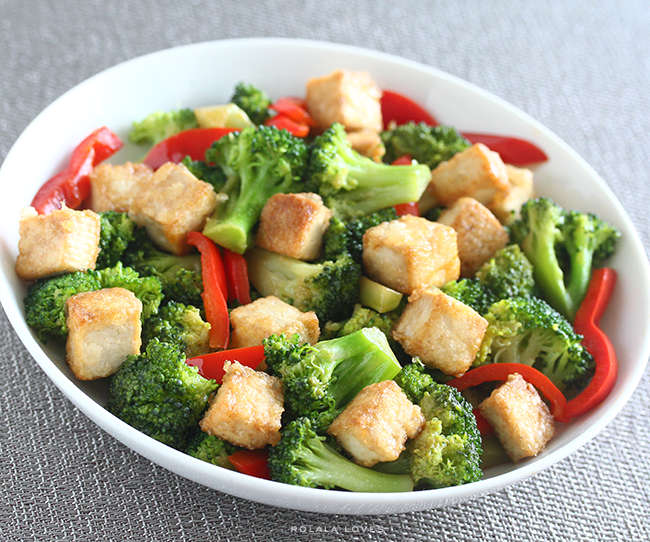 Arrange the broccoli and pepper on a plate, place tofu on top and serve. Looks soo tasty! I've never tried tofu before. Got to put that on my list of foods to try! I do love TUFU but i am not good at cooking it, this one looks good. Mmmmmm! As a vegetarian I would probably love this. Healthy and delicious fast to make my type of recipe need to get rice vinegar and give this a go. We love tofu here too and try to be vegetarian at least one day a week. I never thought about making tofu crispy in this way - brilliant! I'll have to try this some time! I am not a big fan of broccoli but this looks absolutely delicious! The strange thing is most of the bloggers I know, are vegetarians. It's healthier to eat meat not that often indeed, but giving it up - that is something I don't understand. Anyway, everybody know what is best for them. And I think your decision to be a part time vegetarian is good! Thank you for this recipe, I will have it in mind! Great recipe Rowena.... I love broccoli!!! This definitely looks delicious Rowena. I'm vegetarian/pescetarian as well and make quite a bit of stir fry. We make bbq tofu and satay style with cilantro and peanut sauce, which is so good. have you tried this? Sorry, just wasn't sure if I left a comment or not.. That tofu dish looks amazing and incredibly healthy! I wrote another comment which apparently wasn't saved.. I am also not a big meat fan, but I wouldn't dare to call myself a vegetarian, because I don't want people to deprive me of the best meat when we are eating out with friends.. I'm always looking for a way to incorporate broccoli in a meal. It's so good for you. This recipe looks great! i'm a huge fan of chunky veggies! i really need to try this. looks delicious Rowena. You had me at "crispy tofu"! Most of my meals are meat-free as well, so I am loving this recipe! My husband might even try it ;) Broccoli is very filling, so this really looks like a great dinner option. Thanks so much for sharing! i'm the same...i could be part vegetarian. i love my veggies and salads, but still gotta have meat once in a while. i've never made crispy tofu...the texture sounds nice. Thanks for sharing this because I love tofu and broccoli!!!! Hope all is well with you! Oh this looks so FRESH and yummy. I use to be a vegetarian, and I had a friend that was a vegetarian and he allowed himself meat once or twice a year, he called it "Festival of the Flesh" oh boy. Yum!! Sounds delicious! Thank you for sharing! This looks yummy! I want to try some. Looks so yummy!! Thanks for sharing the recipe! I don't eat meat and tofu is the perfective alternative for still getting my proteins. Your meal looks so healthy and delicious! The raw tofu looks nice and firm. Not the mush I have seen recently. yum! looks delicious!! I love simple stir frys like this! This looks so lovely and healthy! I've never had broccoli in a stir fry before. Yum! This sounds so healthy and delicious. The stir fry looks tasty! DANG this looks delicious. Not really a fan of sweet peppers, but as of late I've been incorporating them into my meals more often (stuffed peppers for dinner a few days back!). Oddly, never thought to make crispy tofu at home (we just buy the already puffy deep fried ones from the supermarket), but I need to try this recipe out next week! I need to get some tofu and try this recipe asap! Yum yum yum! Tofu is always my favourite, and broccoli is my hubby's. It's a great combination. The combination of all the ingredients in this dish is what I love. Oh my, I could almost imagine savouring the crispy tofu now. It looks so easy to make! I love going vegetarian once a week just for health sake and also for the environment. I still love certain style of meat but like you, I'm able to survive w/o them at times when the vege dish is already delicious.